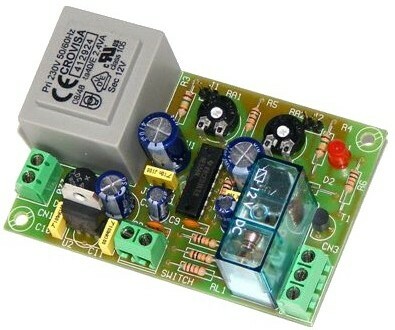 Cebek I-134 module is a mains operated delayed start timer with relay output. The timer can be activated by the use a small push button switch. Once the timer has been started it will not switch the relay until a preset time¹ has elapsed, after this time the relay will operate and stay in this condition until the time² has elapsed. The I-134 module has two PCB mounted potentiometers to adjust the time settings. An LED gives visual indication of the condition of the relay.